Tonight, I found myself somewhere I never thought I would be. The self-help section of Borders. The big sign over the area says Psychology, but the little label on the shelf says "Self Help." Kind of them to try to disguise my anguish like that, but please. If I had a lighter on me, I would have torched the entire section. A bigger bunch of crap I haven't seen in a really long time. I was there for a required reading book, assigned to me by my brand new therapist. I am a good student, so I wanted to get a gold star by having it read by my next appointment. That's not going to happen, because apparently, Borders doesn't carry it on a regular basis. They would prefer that you embarrass yourself even more by having to special order it from a teenager who will make wise-cracks about your mental status as soon as you turn your back. The required reading assignment? Women who love too much. At least, I think that's what it was. I seem to have misplaced the card she wrote it on. At any rate, they didn't have it, so since I was already in the self-help section, I thought I would browse around and see what there was to see. Damn. It made me angry. The Love List Book. 90 days to Love. If I'm so fabulous, why am I still single? 30 days to Heal. I picked up and breezed through If I'm so Fabulous. They should make a rule about re-packaging the same old drivel, because it looked like just about every other dating/breakup book I've ever seen. This one was filled with awful advice, but in a cheery, upbeat tone. It told me that I need to get out there to meet people. Join an outdoor club (check). Take a class (check). Try internet dating (check, check, check, check). Open yourself up to the possibility of love (check, oh, and barf). It disgusted me. Perhaps I should write a self help book - I think I could do it a hell of a lot better than these douchebags. But at any rate, I really wanted to walk out of there with something that would help me start the healing process. It wasn't technically in the self help section, but whatever. I think its going to bring me a lot more joy than the Love List Book. Oh my God you're hilarious! If you write that book, I will pre-order it. How zany is this? I, too was at Borders on Sunday albeit a crapier, smaller one here in my podunk little town. I almost bought the same thing (um, for my nephew). 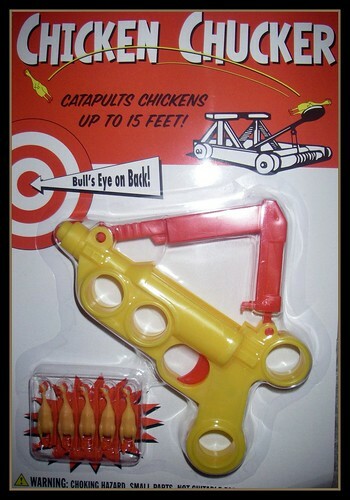 This variation was called the "Cat-a-pult" and instead of chickens, it shot little mini-kitties across the room. Borders also had a Crazy Cat Lady posable action figure, complete with 6 cats. I thought long and hard about buying that too, but decided it would depress me more than amuse me. If only they made a Ped-a-Pult. Complete with mini-pediatricians and mini-babies for me to hurl across the room. That would truly make me feel better right now. I received the crazy cat lady figurine for Xmas from my loving sister several years ago. It does not do any cheering... trust me. I hate to ask, but have you ever read "He's just not that into you"? It's actually good, funny, and a little empowering after you stop telling yourself... I don't care if he's into me or not!